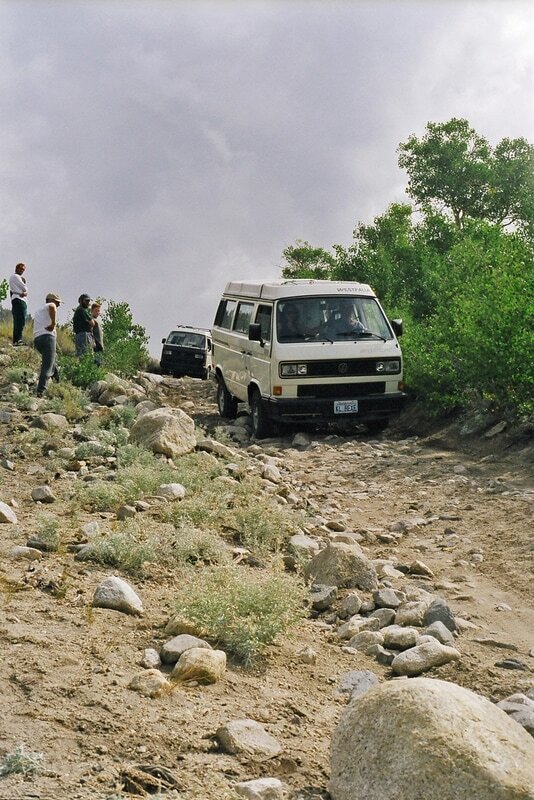 At Syncro Safari, Mammoth 2000 we enjoyed scenic and interesting 4WD trails on Monday, Wednesday, and Friday. The "Back road to Bodie" 4x4 trail and Bodie ghost town visit. 10 Syncros made the trip north up 395 past Bridgeport and then east along a 4x4 trail the the Chemung Mine. 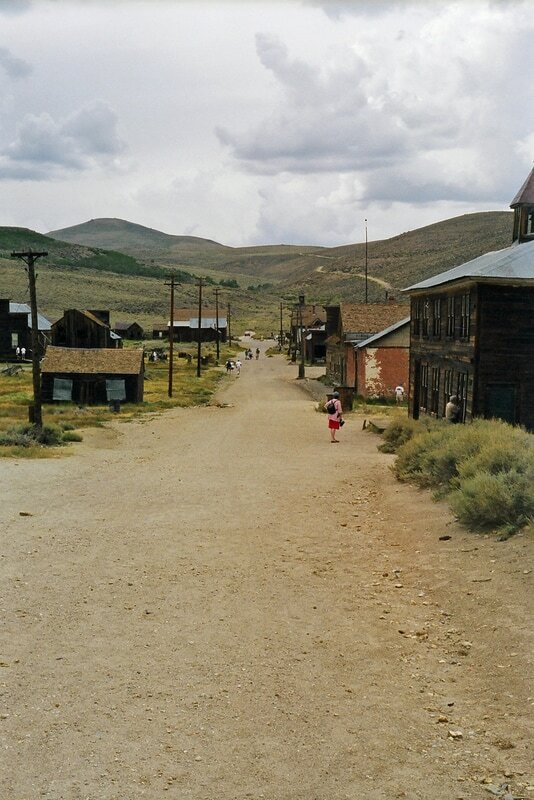 From there, mostly south to the historic ghost town of Bodie. Yes, they charged admission even coming in this back route. Wonderful town with rich history preserved in an "arrested state of decay". Wheeler Ridge and Lake Syncro 4x4 trail. 10 Syncros headed south along 395 past Lake Crowley, then west up along a route called Wheeler Ridge. We lost our route briefly, but is was sort of fun to see 10 Syncros all make a big circle to turn around! This route parallels Rock Creek, on the ridge above the creek to the east and provided several fun 4x4 moments worth photos. One particular rock hill was the 4WD highlight. We stopped for a nice lunch when the trail ended at a small, previously unnamed lake. We decided it should be "Lake Syncro" and erected a forest service type of sign declaring it's newfound name. "Volcanic Tablelands" 4x4 Trip. 6 Syncros remained for Friday's trip to Casa Diablo Mountain, Red Rock Canyon and seeing some petroglyphs . South again from Camp Syncro down 395 we turned east and enjoyed 4-wheeling over Casa Diablo Mountain, and then the beautiful drive through the narrow and colorful (yes, red) Red Rock Canyon on Chidago Canyon Rd. Coming out of the canyon we found the petroglyphs along Fish Slough Road. Some showers cut the time at the petroglphs short and we headed northwest to visit some hot springs near Hot Creek. The "Back Road to Bodie"
From the junction of US-395 and CA-182 in Bridgeport, travel 3.3 miles north on 182 to an unmarked side road on the right. If you get to Masonic Road, (it's more traveled and you could take that too), you've gone about 0.5 miles too far. On this unnamed road, travel 5.6 miles until it joins Masonic Road. This is a narrow road and depending on the season, the brush on the sides can be quite tight. If you're paint is really important, you might just take the more traveled Masonic Road. Turn right on Masonic and travel northeast 1.0 miles and you'll reach the Cheming Mine. Very nice mining ruins here. Be careful poking around and don't take any souvenirs! 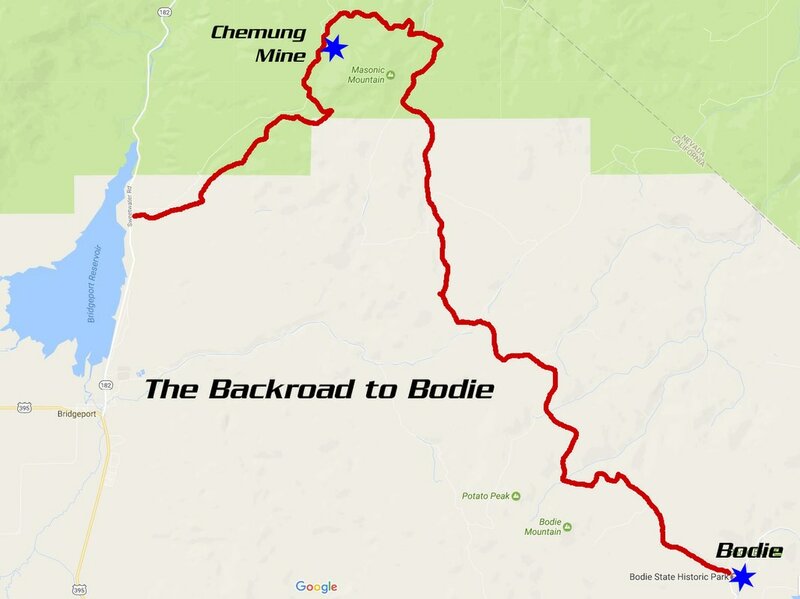 From the Chemung Mine, it's another 18.2 miles to Bodie. Continue north on Masonic Road as it curves east and then southeast a bit. 2.8 miles from the Chemung Mine, turn right on "Bodie Masonic Road" which will travel south, then southwest. 0.6 miles from Chemung, turn left to stay on Bodie Masonic Road. From here the route meanders a bit through open countryside and through valleys going generally south until you reach Bodie. Plan on a minimum of 2 hours here, more if you have some history buffs or ghost town enthusiasts who will want to linger. If you want to take the guided mine tour, plan a longer stay and arrange that tour as soon as you arrive so you'll get a spot. arrested state of decay" which means they are not fixing it up, but are working to keep it from decaying any further. With harch winters in the Sierras, this is an uphill battle. Leaving Bodie, you can take the direct route out to the west to find US-395 13 miles west of Bodie, or various routes to the south that head toward Mono Lake. From the junction of US-395 and CA-203 east of Mammoth Lakes, take 395 south 15.9 miles past Lake Crowley and Tom’s Place to Old Sherwin Grade Road, and turn right. Travel on Old Sherwin Grade Rd (also called Lower Rock Creek Road) 4.3 miles and turn right on Swall Meadows Road. Going west on Swall Meadows, veer right at the fork after 0.7 miles and you’ll be on Sky Meadow Road. Then turn right onto a small dirt track after 1.2 miles from Sherwin Grade Road. In about 200 ft you’ll find a large flat “staging area on your left. This makes a good place to gather your group for a minute before heading on. From the staging area turn right to begin the route. Reset your odometer. From the staging area you’ll travel north and west and cross over Witcher Creek (probably dry) and turn left. Reset your odometer. You’ll be travelling mostly west on a trail that parallels Witcher Creek and after 0.5 miles, turn left to continue along the creek. After 1.2 miles you’ll curve right and start climbing away from the creekbed. At 1.3 miles, turn left and then travel up over a rise and down into another canyon. At 2.3 miles you’ll cross Birch Creek. Reset your odometer. After 0.75 miles from crossing Birch Creek you’ll start a couple broad left curves that will take you in a southerly direction. By about 1.3 miles, you’ll be headed almost straight south, you’re primary direction the rest of the way to Lake Syncro. Along this southerly route Rock Creek Canyon is to the west and you'll look up at Wheeler Ridge to the east. You’ll pass through mostly open terrain with occasional wooded stretches. 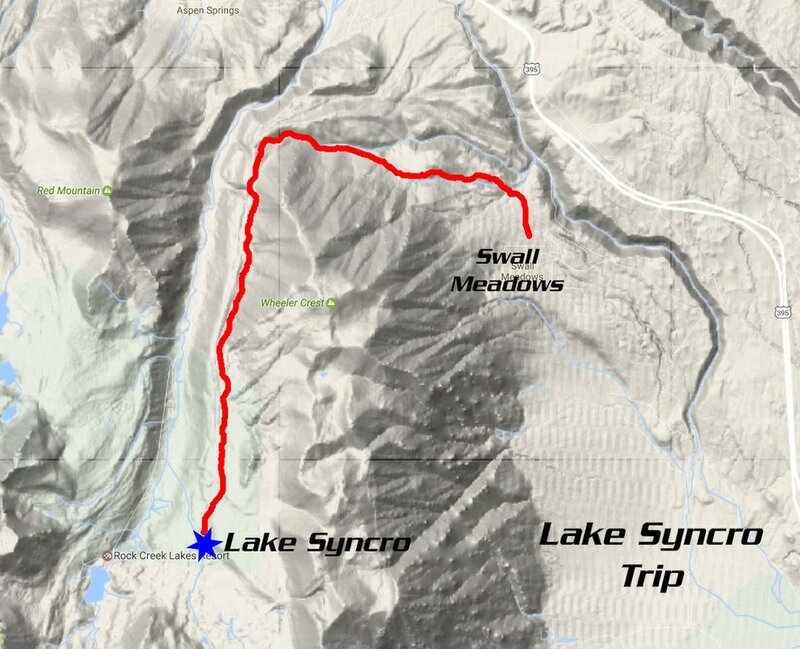 After 6.0 miles from crossing Birch Creek, you’ll arrive a t a wooded area with Lake Syncro just ahead to your right. Here’s there’s plenty of parking and nice shady trees, making this a great spot for lunch and perhaps some fishing. The route is not difficult except for one rocky uphill section somewhere about hallway between Birch Creek and Lake Syncro. Plan on a minimum of an hour here to enjoy the lake, the breeze and the shady pines. Try your luck at fishing - there was at least one fish here in August 2000! If you have a hammock, there are plenty of nice trees to string one between and relax. Back is reversing the route you took to get here. From the junction of US-395 and CA 203 east of Mammoth lakes, travel south on 395 for 5.4 miles past the Mammoth Airport to Benton Crossing Road and turn left. Reset your odometer. Benton Crossing Road goes northeast to Benton Crossing, where the road crosses the Owens River. 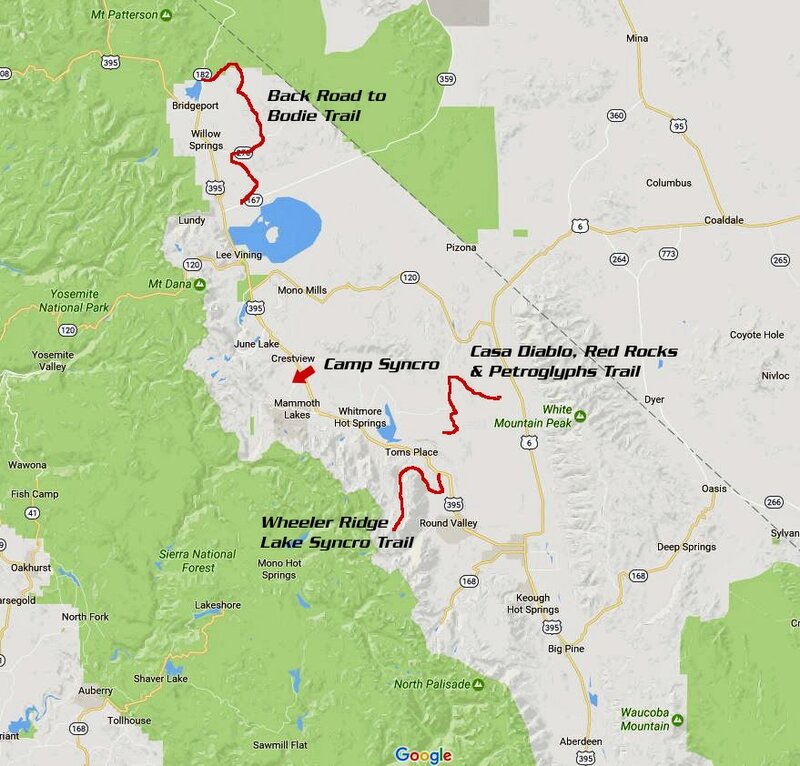 At 6.5 miles from US-395, you’ll cross the river and begin travelling southeast, then about due east. At 17.5 miles from US-395 turn right (south) on Casa Diablo Road. At 18.6 miles turn left to stay on Casa Diablo Road. At 23.0 miles, take the left fork, more or less going straight on to Casa Diablo Mill Road. Reset your odometer. We’ll call this the start of the 4WD route. Travel east on Casa Diablo Mill Road across the open valley for about 0.5 miles, and then start the accent up the hill. At about 1.2 miles you’ll reach a spur on the left with a view over the east side of Casa Diablo Mountain. You can continue south another 0.2 miles south to the end of the road. Backtrack down the west side of the mountain until you reach the first junction. Reset your odometer. Turn right on this dirt road and travel north. At about 0.5 miles, take the right fork and go up over a rise and then down into the small valley to the east. You’ll be travelling north east as you cross a north-south road, but continue northeast. Continue on the main track and at 3.3 miles turn left at the T. You’ll drop down into a valley and at the 4.1 mile mark turn left again at the next T, now heading west. At 4.4 miles turn right on to Chidago Loop and reset your odometer. Travel north on Chidago Loop for 3.7 miles where the road will turn to the east and start descending into the “Red Rock Canyon” where the road is now called Chidago Canyon Road. At about 5.0 miles the canyon narrows and the red rocks start to appear, closing in on each side of the canyon. This narrow, red rock part of the trip only lasts for about 1 mile, so take it slow and enjoy! At 8.0 miles turn right on Fish Slough Road. 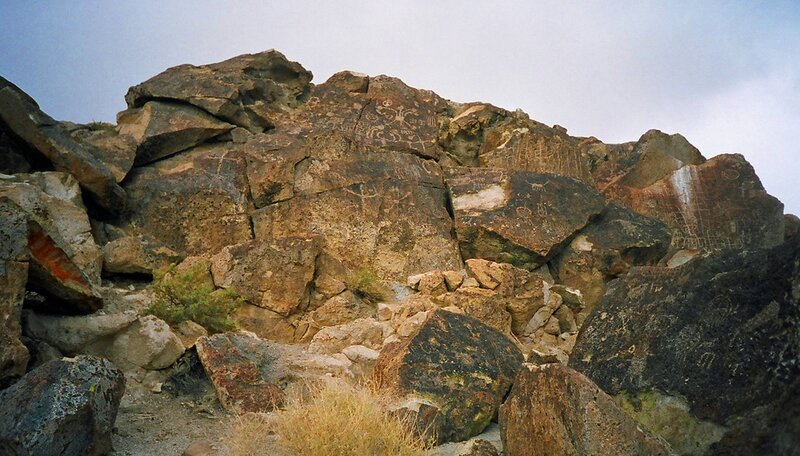 At the 8.5 mile mark, park on the right and enjoy the walk through and around the petroglyph-sprinkled rocks. Reset your odometer. From the petroglyphs, you can backtrack 8.5 miles up through the canyon again the way you came in, west up Chidago Canyon Road, and south as the route becomes Chidago Loop. At this point, turn right at the T and reset your odometer. Head west on Chidago Loop and at about 1.5 miles it will turn north. At 5.2 miles you T into Benton Crossing Road. We’ll call this the end of the route. Turn left and you’ll come to Benton Crossing after 13.1 miles, and be back at US-395 at 19.5 miles.